Could there be a more idyllic front yard?! Writing retreats: super productive, accelerated write-athons, or an excuse to get together with friends and be a bad caffeine-fuelled cliche full of cheese, wine and chats? Um, is it okay if it’s a bit of both? Because that’s pretty much what my recent weekend away with four writing friends was all about. And as far as I’m concerned, it was a success! 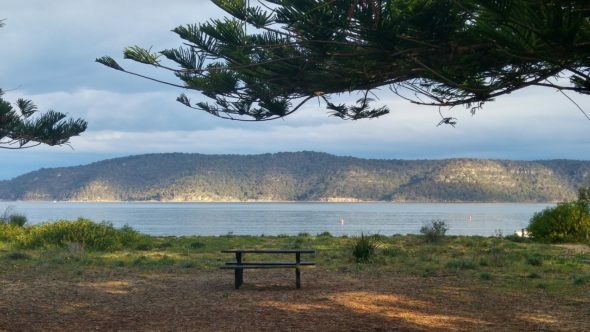 Here are the ins and outs of our three-day stay in beachside Patonga, which might be useful if you’re thinking of holding your own DIY writing retreat. – Rules schmoolz – we kept the structure of the weekend very loose, which allowed for random bursts of writing, workshopping each others’ ideas, brainstorming difficult plot points and critiquing each other’s work whenever, interspersed with beach walks, chats and endless tea. It was a great mixture of work and fun, and something with a more rigid timetable just wouldn’t have had the same vibe. I think this comes down to personality though, and the way you work best. It also meant we wrote and edited when ideas struck rather than because we were meant to. – Word sprints – You may have seen #500in30 floating around on social media – it was basically just like that. This was where we started a timer for 30 minutes and wrote non-stop, with the aim of reaching at least 500 words. While of course you can complete these in your own time and space, doing them together felt even more productive. Something about being accountable and not wandering off to the fridge or kettle, perhaps. We did these towards the end of our stay which worked well, as it put all the ideas generated through brainstorming and workshopping onto paper. And speaking of – some people typed while others literally used pen and paper. Whatever works for you! 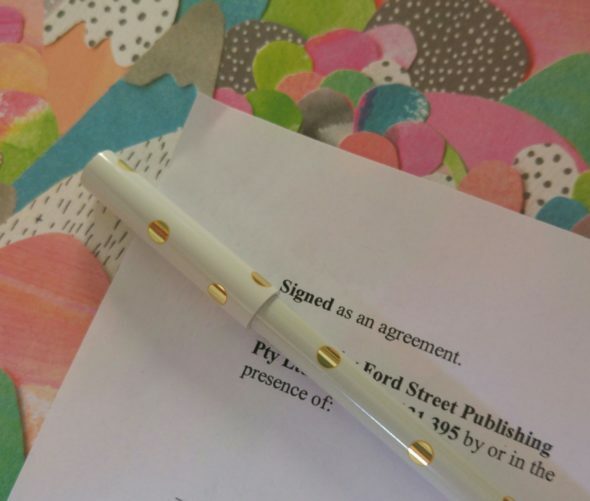 – Critique swaps – at random times throughout the weekend we’d break off into twos for a critique swap, whether it be a picture book manuscript or a chapter or two. Without printers on hand, we did this by basically swapping laptops and just marking up comments on the document. – Not enough ‘stuff’ – It’s hard to find fault with such a great weekend (thanks guys!) but if thinking about it from a ‘next time’ point of view, maybe staying somewhere with more ‘stuff’ would be fun, albeit distracting. We went to a café a few times, but had to drive to the next town over (Pearl Beach), so staying somewhere with a few cafes and shops to explore in periods of down time (let’s call it ‘thinking time’) would be fun. And somewhere to go for dinner would be good, too. The one place to eat out in Patonga (a waterfront pub) was closed for renovations, so we mostly ate food we brought with us (chocolate is a meal, right? ), and one night picked up Thai from a couple of suburbs away. We rented a house via Airbnb, and while it wasn’t the cheapest house around, it felt like the perfect pick. 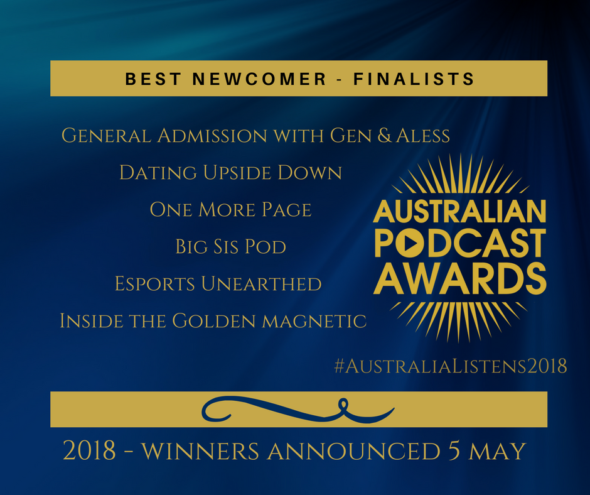 We wanted a place that was within 1-2 hours drive for all of us, coming from various parts of Sydney and surrounds. Patonga on the lower Central Coast fitted the bill; alternatives could be the Southern Highlands or the Blue Mountains. We were fortunate enough to stay in a fantastic four-bedroom, two-bathroom house spread over two levels, so there was plenty of space for everyone. Despite two people having to share one room, it never felt too crowded. Most of our time was spent in the open plan dining/lounge room and there was lots of space to spread out – two big couches, a dining table and a smaller table with chairs, so everyone had their own writing spot. There was another dining set on the outdoor deck which would have been great in warmer weather. A smaller living area wouldn’t have worked quite as well, so I’d definitely prioritise a spacious communal area over big bedrooms. Conveniences like WiFi, a dishwasher and heating throughout the house also made the stay a comfortable one, with the kitchen situation great for the gazillions of coffee cups used over the weekend. Without a dishwasher it would have been a whole lot more annoying, with domestic chores taking away from writing time. Another plus was having linen included, so everyone didn’t have to lug their own sheets and towels there and back. A place on a busy road wouldn’t have been anywhere near as relaxing as our quiet street in a relatively isolated village. Think about the noise factor when picking a place – it’s a writing retreat after all, and the sound of lapping waves is more conducive to thinking time than party noise and traffic. Although as mentioned above, it can be worth considering if you want to be near village shops for cafes, food and other distractions. Or not! – A day (or stay) at a writing friend’s house – preferably one with a big communal space, whether it be a lounge room, back deck or yard, with plenty of spots to sit. – A few hours at a café – especially one with a communal table and nice staff who don’t seem annoyed you’ve outstayed your welcome (you should totally be on your fifth flat white by now …). 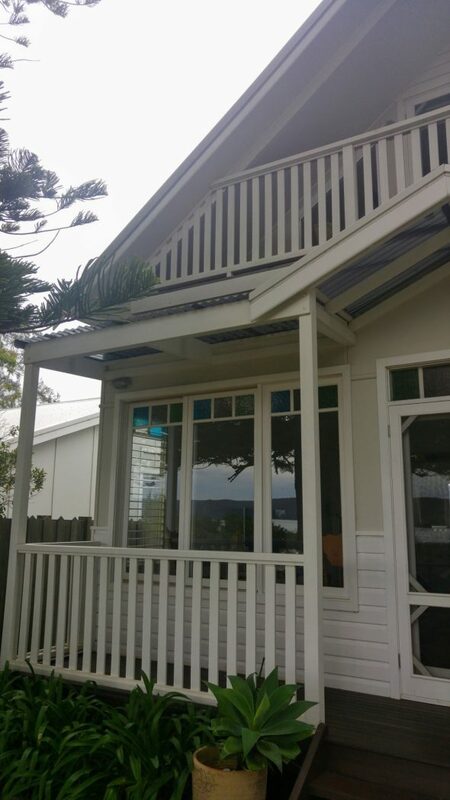 – A room at your local writers’ centre – if you’re a member of a writer’s centre, check their room rental policy. Many allow members to use their rooms free of charge. 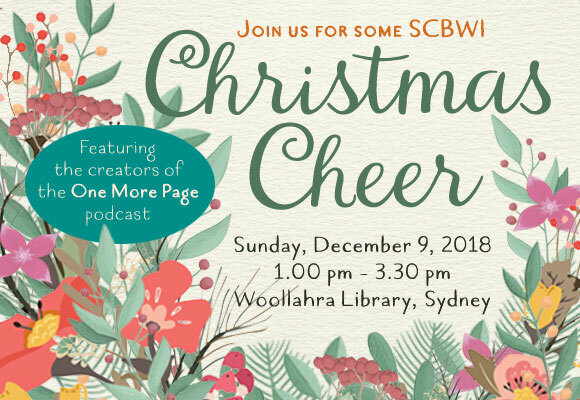 – A day out and about – if you’re looking for story ideas or writing prompts, you could meet at an art gallery, museum, market or fun park (SCBWI sometimes runs sessions like these called Scribble and Sketch). Wander around and stop to observe for a while, and use your senses to generate scenes, or people watch for character ideas. Public transport journeys alone can be great for this. The possibilities are endless! Harriet loved costumes. She loved them so much, she wore them all the time! On the day of her own dress-up party she went shopping for supplies with her dads (while dressed as a penguin, of course) and got carried away – *actually* carried away, by penguins! 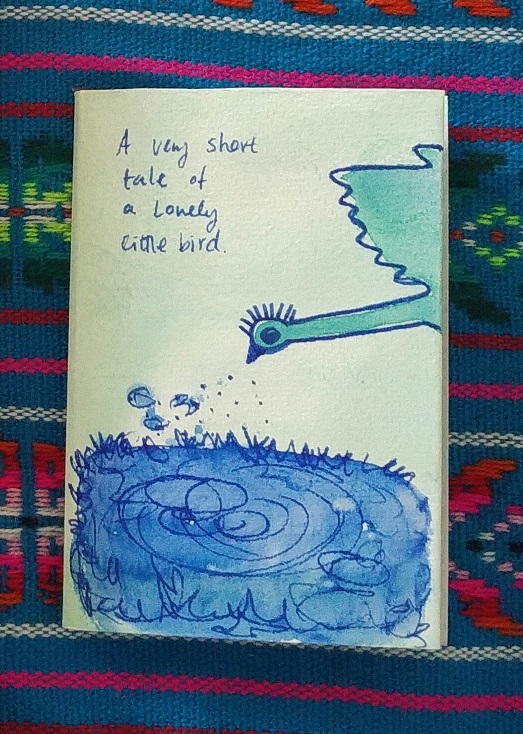 This is an absolutely adorable story that blurs the line between reality and fantasy. It highlights the magic of getting ‘carried away’ and is ultimately about belonging. The purple-toned illustrations with their touches of yellow suit both the urban and Antarctic settings, and lend the book a unique feel. 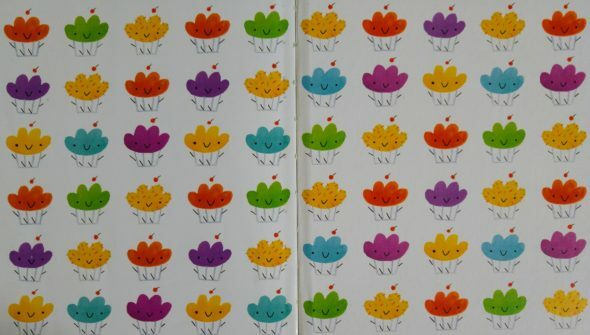 I love everything about the design of this book, from the hot-air balloon endpapers, to the different cover under the dust jacket (Harriet in all different costumes – cute!). when one emerged from the sea. Pictured above: a few favourite cards picked up at KidLitVic, a fabulous writers’ conference now in its second year. 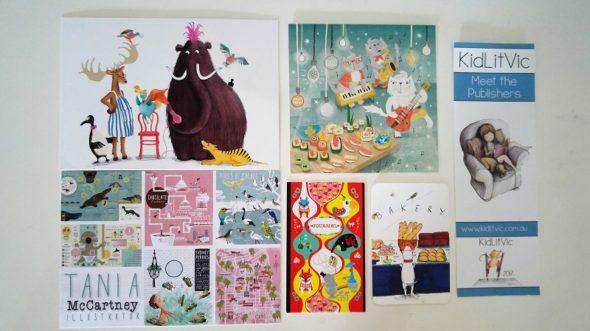 My card stash features the work of illustrators (from top left, clockwise): Allison Langton, Caitlin Murray, Nicky Johnston, Luisa Gioffre-Suzuki, Irene Tan and Tania McCartney. Aren’t they all amazing?! One of my favourite parts of the conference was checking out the illustration portfolios on display (so much talent, sigh!). 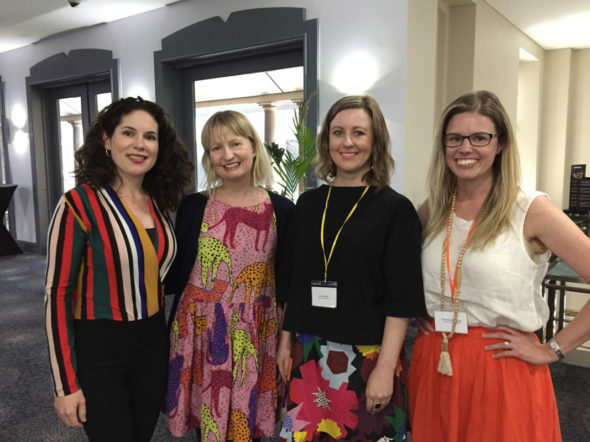 The publisher panels offered the inside word on kids’ books, the atmosphere was fantastic, and the organisers (author Alison Reynolds and team) once more did an amazing job pulling everything together. Industry insights aside, meeting up with other writers and talking all things books and publishing was undoubtedly a highlight. Especially when debriefing afterwards over delicious Malaysian food! I stayed at my friend and fellow conference attendee Cat’s place, and we managed to squeeze in some Melbourne must-dos (like Readings Kids!) into our whirlwind of a weekend. With Cat and her kids as tour guides, we hit Lygon Street in Carlton for a cannoli fix at the treat-laden Brunetti’s, before a book-ish droolfest at Readings Kids. I so wish there was a carbon-copy in Sydney! 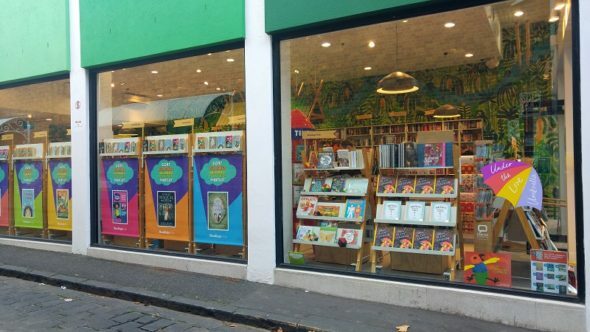 Packed with everything from picture books to the latest #LoveOzYA reads, you can easily spend hours here (and lots of $!). I came away with a small stack of new reads, including some titles from my kids’ current favourite series, Truly Tan and Isadora Moon, about a half-vampire, half-fairy (super cute!). Along with some other writer friends, I attended fellow critique group member Shelly’s book launch at The Children’s Bookshop in Beecroft. 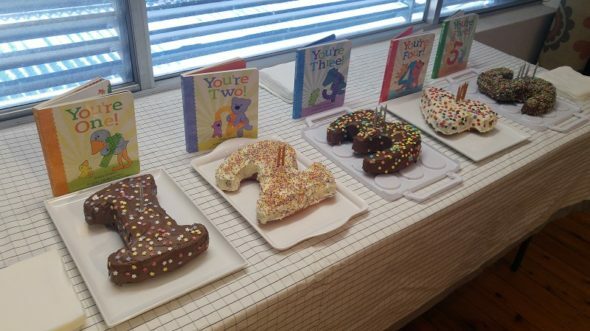 It was the first of several events launching her You’re Five series, with a book celebrating each age from 1 to 5. A great concept, and a beautiful package complete with Katherine Battersby’s charming illustrations. 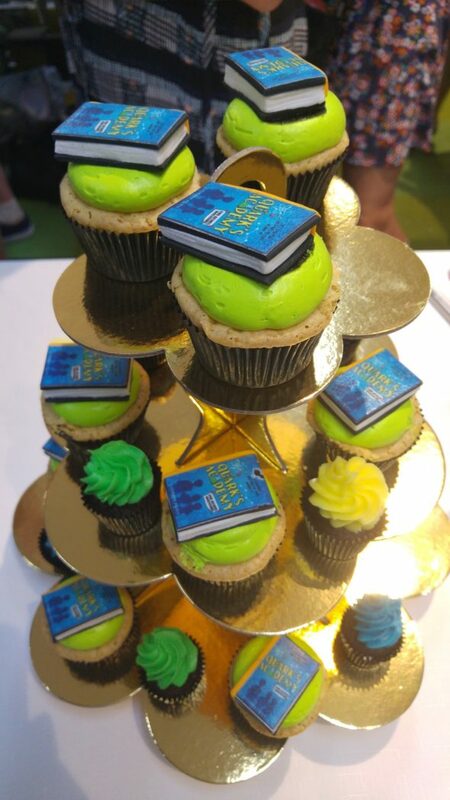 After introductions from bookshop owner Paul MacDonald and guest author Jacqueline Harvey of Alice Miranda fame, Shelly ran a fun storytime session followed by the perfect accompaniment – birthday cakes! In other bookish news, I went to a fascinating talk at Five Dock Library by Perth-based author Natasha Lester, with a focus on her latest historical fiction novel, Her Mother’s Secret. She filled us in on her publishing story, her writing routine and the in-depth research she conducts for her books. Her latest release is set in 1920s and 30s Paris, and centres around the birth of the make-up industry. I love the way Natasha’s books weave historical events with issues concerning women’s fight for equality (highly recommend her previous book too, A Kiss for Mr Fitzgerald, set in 1920s New York). Natasha is such a warm and open presenter, and it was so nice to meet a writer whose work (and advice-filled blog) I hugely admire. 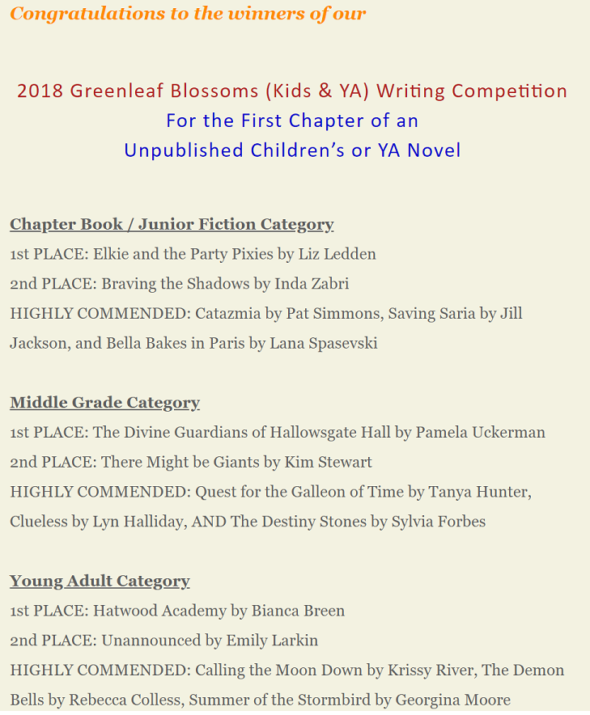 More books, more authors, more literary fun times! 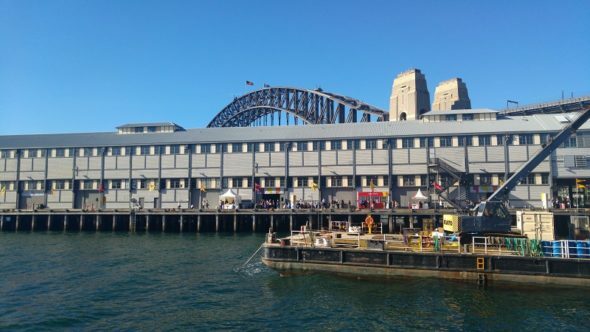 This year’s Sydney Writers’ Festival featured an amazing program, and their family day was no exception. We took our kids to see UK Children’s Laureate and Charlie and Lola creator Lauren Child, who talked about her influences and creative processes. Even Quentin Tarantino movies form the inspiration behind her beloved children’s books. 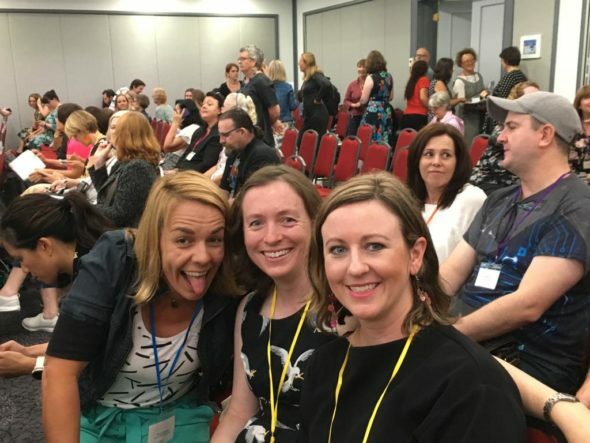 We also saw the always hilarious Andy Griffiths, with glimpses of his upcoming 91-Storey Treehouse book, followed by a session with picture book creators Davina Bell and Allison Colpoys. 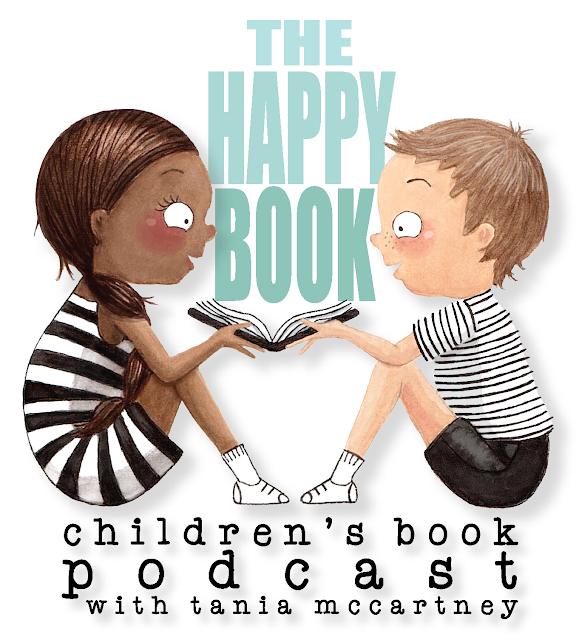 They shared the stories behind their stunning picture book, Under the Love Umbrella, from initial idea and napkin scribbles on a Brooklyn-bound train, to the intensive illustration process. In other SWF news, I did a children’s writing masterclass with R.A. Spratt (Friday Barnes/Nanny Piggins). As well as being highly entertaining, she offered some great tips from plotting to using IRL observations of conflict as story fuel (recommended: a Saturday trip to Ikea!). ~ Concrete Jungle in Chippendale, for their super health-packed bowls. ~ The perfectly tiny Glider (in the same laneway), with the cutest coffee coasters, like mini-wooden pallets. 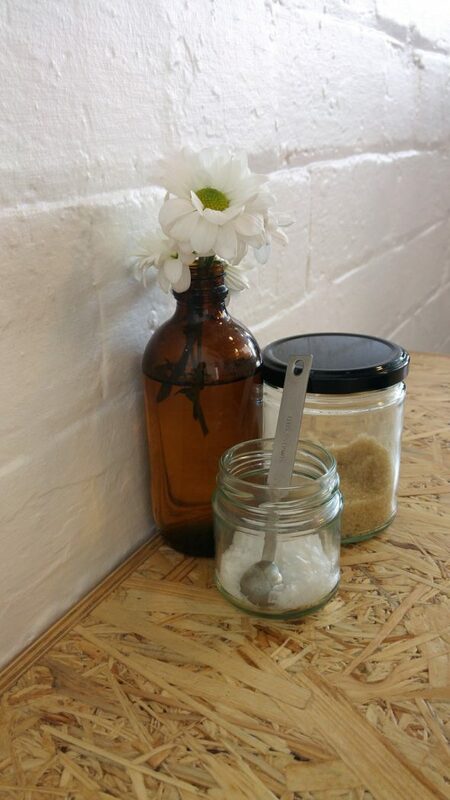 ~ And new Summer Hill cafe, Goodbye Horses – great coffee, music and staff (and plants! ), and a backroom that feels just like a dining room in a terrace house. Inside Under the Love Umbrella – look how gorgeous! 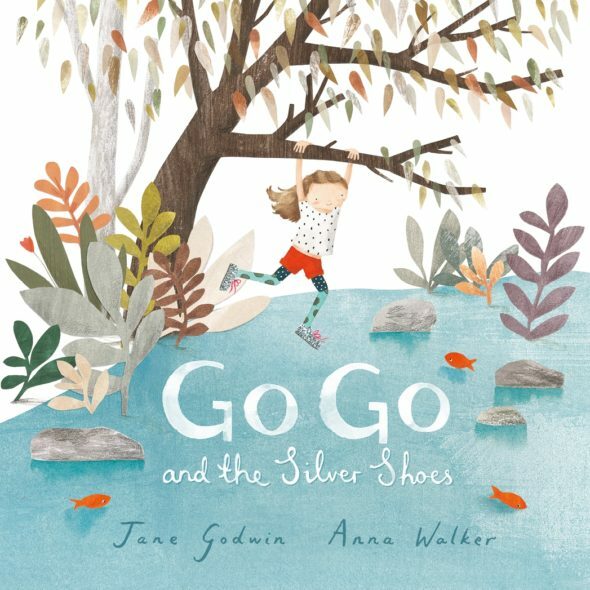 Some picture book reading highlights this month include the absolutely gorgeous Florette by Anna Walker – the charming story of Mae who moves to the city and pines for her old garden, then comes up with the perfect solution while on a walk. It’s inspired by the creator’s time in Paris, the illustrations are stunning, the prose is sparse yet touching, the endpapers are lush and jungle-y and it’s perfect in every way! Anna Walker is a firm favourite, I can’t wait to see what she does next. 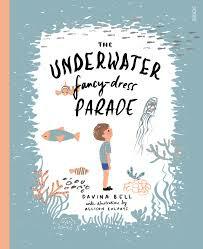 Also on my picture book radar this month were two more Australian titles, Under the Love Umbrella (by Davina Bell and Allison Colpoys) with its swoonworthy neon illustrations (seriously – this book will have to win all the illustration awards, amazing! ), and the poignant One Photo (Ross Watkins and Liz Anelli) about memory and loss, with the most touching ending. On the lighter side, I also enjoyed library find Unicorn Thinks He’s Pretty Great, by American author/illustrator Bob Shea. A goat is jealous of the new unicorn in town, with his fantastical feats like making it rain cupcakes. Then unicorn discovers something goat can do – make his own cheese! Competitiveness and mayhem ensue until the two team up. 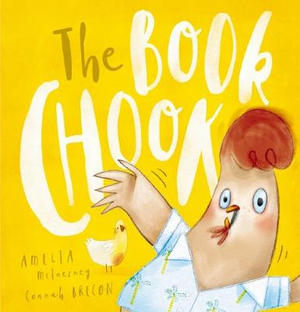 I love the quirk factor this book brings in major doses – so much fun! Then there was P. Crumble’s The Cat Wants Custard, illustrated by Lucinda Gifford, who I enjoyed hearing speak at the SCBWI conference last year. I love the attitude-laden voice of this cat who will stop at nothing for a bowl of creamy custard – until he actually tastes it, that is! This book has become a series, so I can’t wait to read the other titles! And speaking of cats with attitude, there was the super cute I Don’t Know What To Call My Cat by Simon Philip and Ella Bailey. A difficult to please cat arrives on a girl’s doorstep one day, and doesn’t suit any of the names she comes up with. Then it leaves! I won’t ruin the ending for you, but let’s just say it gets a very suitable name in the end. A fun ‘extra’ is the pictures of all the cats on the front and back covers, each with names appropriate for their appearance. 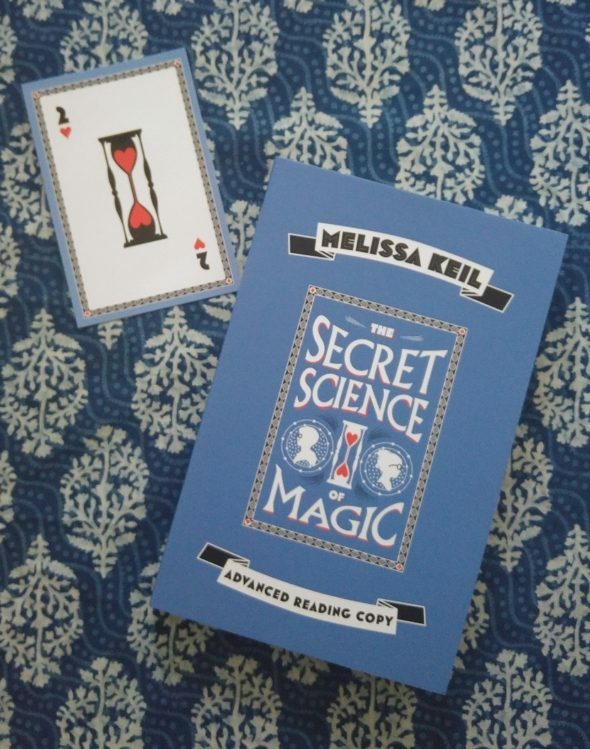 Other reads beyond non-stop PBs included new YA novel, The Secret Science of Magic, by Melissa Keil. The story features Sophia, a science whiz and Joshua, a magic lover and slacker, navigating their last year of school and Josh’s longstanding crush on Sophia. Sophia turns to logic and science to explain everything, especially when things seem out of her control. The book is told via both character’s points of view, with non-stop smart and sassy dialogue. The entire time I had my fingers crossed for them! I have a review of this book coming up on BuzzWords’ blog sometime soonish. Then there were my latest book club reads – The Dry by Jane Harper, and Relativity by Antonia Hayes. Both by Australian authors, both incredible. The Dry is a rural crime page turner and I was hooked from the start. Based in the fictional country town of Kiewarra, a city-based cop has returned to investigate the supposed murder-suicide of an old high school friend. Secrets from the past unravel the further he digs, and it’s lots of fun trying to guess the culprit. Addictive! Relativity feels so raw and real, with the author drawing on her own situation where her child suffered from shaken baby syndrome at the hands of a partner. The aftermath is completely compelling and heartbreaking, but with many moments of warmth and hope throughout. I loved the familiar Sydney setting too, with real-life landmarks around Glebe and the city. 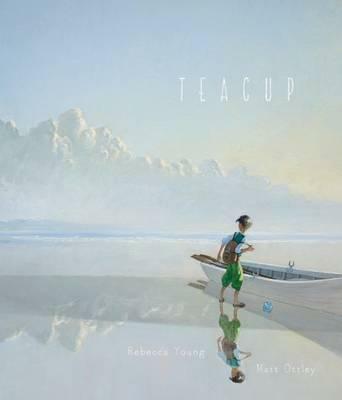 A hauntingly beautiful story with a wonderful message of hope, Teacup follows the boat journey of a lone boy. Where he’s from or where he’s going isn’t stated, giving it a fable-like quality, though I see it as an age-appropriate introduction to the plight of refugees. The illustrations veer from dreamlike pastels to dark tones, mimicking moments of hope and dangerous encounters. The idea of the teacup holding earth from home and the new life it provides is truly magical. This is a repeat borrow – I absolutely love this book and this clever pairing, and can’t wait to read their second book together, Under the Love Umbrella. 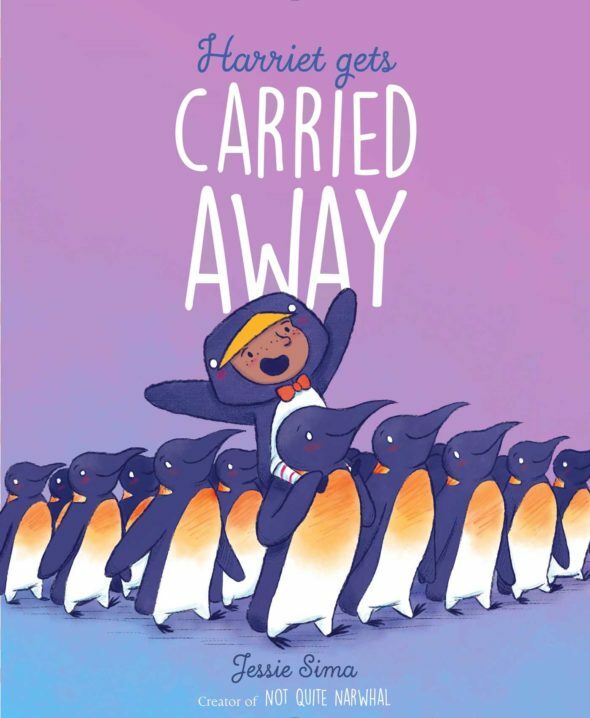 The blue and orange toned illustrations have a striking, retro feel, and the emotional journey of Alfie (who doesn’t feel brave enough to be Captain Starfish in a school parade) is so realistic and relatable. 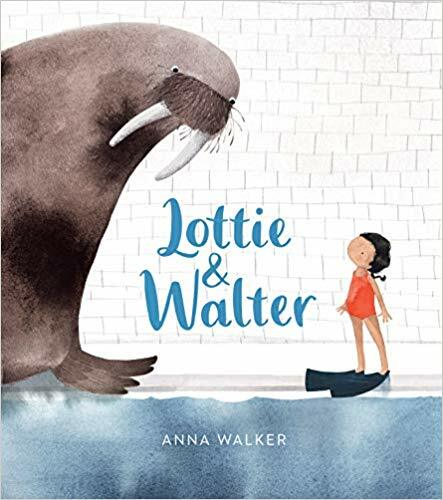 It’s a wonderful book to share with children to show they’re not alone – anxieties about seemingly small things are so very real – and from a writer’s point of view it’s a fabulous mentor text. 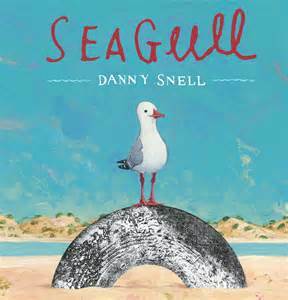 Seagull’s freedom to fly is at stake as he becomes tangled in some rubbish on the beach. No one seems to be able to help despite their efforts, until a small but kind gesture is just enough to set Seagull free. This is a gentle yet touching book with some important themes, from caring for the environment to noticing and helping those in need. The changing colours of the sky reflect the story arc – a beautiful touch. Franklin is a loner with a big imagination, and, you guessed it, spots all manner of things in the clouds. Actually, not just things but ‘adventures in the sky’ (love!). When Scruffy Dog comes along and joins in the fun, Franklin is far from impressed and plots to get rid of him. But cloudspotting is a lonely affair, and perhaps two cloudspotters are better than one! 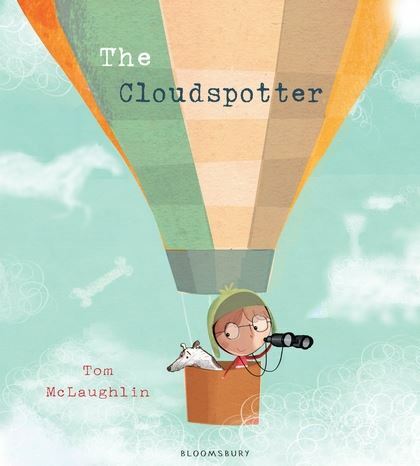 So full of charm and fun, with vibrant illustrations, The Cloudspotter is for dreamers of all ages. 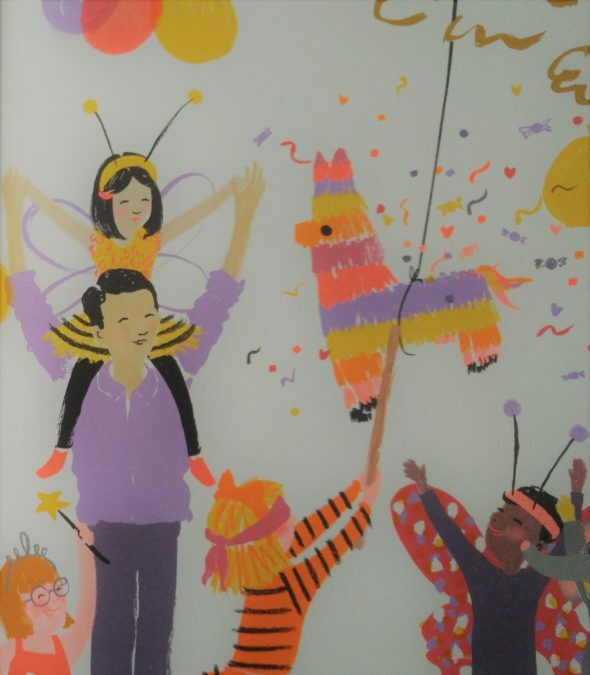 Pandora is one of the most beautiful picture books I’ve come across this year. 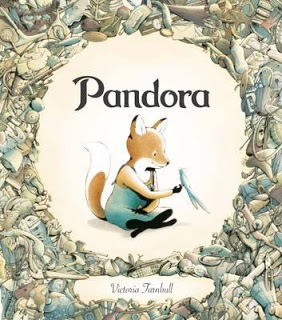 It’s a sparse and emotional tale about a sweet little fox called Pandora, who lives alone and repairs lost and broken things. One day a bird falls from the sky, and Pandora looks after it until it’s well enough to fly. The bird then brings back gifts each time it returns, except one day, it doesn’t come back. Pandora is so beautifully written and illustrated, and (spoiler-ish alert) ultimately so uplifting. It’s about kindness, preservation and hope. Not only are the contents divine, but the cover is actually coated in a silk-like fabric, the perfect touch for such a special book. Love, love, love. I can’t stop re-reading it.